...positive for the blue-chip average 40 times and negative in 27 times. The S&P 500 typically rises 0.9% over the month, which is also good enough for seventh place, based on historical averages. The benchmark index has the same ratio of positive Octobers to negative ones as the Dow. For the Nasdaq Composite Index October stands as the eighth-best month of the year, based on data that goes back 46 years. It has historically risen 0.7% over the month, and October has been positive for the Nasdaq in 25 of the past 46 years. In a positive sign for investors, however, midterm years tend to correspond with extremely strong Octobers, according to the Almanac. While the Dow rises 0.6% in October overall, it jumps a far stronger 3.1% in midterm years. The S&P climbs 3.3% in midterm Octobers, more than three times the average overall gain, while the Nasdaq jumps 4.2%, six times its overall average. For both the Dow and the S&P, October is the best month of the year in midterm years, while it is the sixth-best for the Nasdaq. In another quirk of seasonality, October is the most volatile month of the year, as measured by the standard deviation for the major indexes. For all Octobers since 1896, when the Dow was created, the standard deviation of the Dow’s daily changes has been 1.44%. 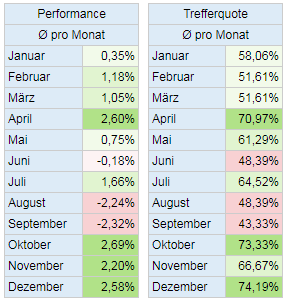 That compares to 1.05% for all months other than October.